Washed my cloths. Bad diarrhea. Taking medicine. Some better in P.M. Move forward to Big Sandy creek in the evening - three miles. Inspection of Div. in A.M. by Commanding General. Sherman's Corps arrived at Little Sandy creek in P.M.
Army moving forward. My health some better. Our Div. Moved in P.M. Encamped at Cayuka just after dark. Very poor water. March badly conducted. Brigades mixed up very much. Jackson about 35 mi. Sherman's Corps reached Cayaka about 8.00 A.M. Met Capt. McCoy - he as natural as life. [Capt. 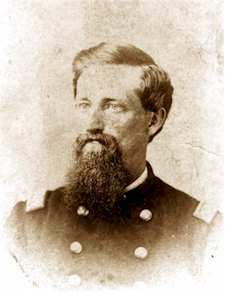 James C. McCoy was Gen. Sherman's aid-de-camp. Hussey may have corresponded with him when he was Col. Landram's aid-de-camp.] Our regiment glad to see Sherman. Steel's & Tuttle's Divisions passed by. Buckland commands a Brigade in the last named Div. & has his own regiment in it. Wrote short letter to My Wife at night. No chance to Mail. Recd Inspection of our Brigade. Ready to move at daybreak. Div. Moved forward early. Went within 2 mi. of Black river & turned to right toward Jackson. 97th Ill. went to Black River. Heavy Cannonading tonight in the A.M. Long halt just after M. 8 Mi. to Edward's Station on Jackson & Vicksburg R.R. Encamped at Widow Montgomery's Plantation - 6 mi. from Cayuga. Her Grand Son-in-law Surgeon in Brag's Army. Got servant named "Elic" - belonged to Mr. Sulser. Marched 6 mi. toward Raymond & encamped 12 mi. from that place on Barron's Plantation. News of Great Battle in Va. [Chancellorsville] Stonewall Jackson killed. & the Rebels much worsted. Report that Hurlbut has wipped the enemy in Tenn. or North Miss. Maj. Gen. McPherson's Corps had a fight on 12th inst. & wipped the Rebs. Wrote short letter to my wife & put in envelope with one of 11th. Recd a letter from My Wife in the evening of 26th ult. Compared Rolls. Considerable of rain in the evening. Bed of Cotton burned - nothing injured. Letter in regard to Chance. Recd official notice of Binegar's death [Moses Bringar, Co. A, died 2/28/63 at Jefferson Barracks, Mo.]. Wrote to my wife answering her letter of 26th ult. Raining. Head of large supply train arrived. About 7.30 A.M. On Picket. Sent 3 letters to Grand Gulf. Moved forward at 10.00 A.M. & arrived at Raymond after dark. Went into Camp. Country broken. Expecting fighting tomorrow. Roads muddy. Plantations - Dillon's (Butler), Whittakers, Bullit's, Bob Miller's &c.
Fine clear morning. Ready to March at 6.00 A.M. Lt. Thomas M. Wright [Co. H] died early in the morning. Made detail - Pope & Beeson - to bury him. My health medium. Raymond a nice business town. Moved forward toward Edward's Station. Fighting about 7 mi. from Station - communication about 11.00 P.M. - Carr, Osterhaus, Hovy & Blair together with our Div. Engaged. The Rebels said to number 30 or 40 thousand. Rebels driven at every point. McWright [Pvt. Thomas M. Wright, Co. H] buried in a cemetery near Raymond "T.M.W." cut on large pine tree. Movement Commenced early in the morning. Six cannon captured of the enemy. Our Regt. & the 108th Ill. guarding trains & prisoners. Our success yesterday very complete. About 3000 prisoners. 74 pieces of artillery taken since we we landed on this side of the river. Troops lieing in Rebel works on Black river. Building bridges to cross over the River. Our Army in high spirits & confident of success. Mail came Recd a bottle of red ink - don't know who from. Our Division but slightly engaged.